I couldn’t place it. Whose book was this? (I edit a lot of scifi.) As my eyes swept upward, I realized the book was mine, and those were the last words I had written. It was a bizarre wake-up call. Writing styles are like fingerprints, and that is clearly mine. I’m not sure I like the words (come on, They’re real, yo? ), but at least now I remember why they exist. They were the start of the next interview section, as the book takes place as a series of interviews between the billionaire who created the androids, known as Minäs, and his granddaughter. So there are two stories taking place, the granddaughter’s present-day story and the granddad’s story of how the world came to be as it was. There is a lot to juggle in this book, and sometimes I have to remind myself that it was supposed to be humor. Still…They’re real, yo? Oh, brother. I need to become a better conduit for my own work. Aren’t they? Red marks all over my manuscript, or, in this case, all over chapter three of my manuscript, mean that I have something to focus on. Let’s face it. I’m busy. Right now, my desk is piled high with school work to check, plus 3X5 cards with notes to myself, plus bills and other business correspondence that need to be paid or filed away. Underneath the stacks of schoolwork, however, sit those marked-up pages of chapter three, which means that I’ll have something to immediately work on when I have a few moments to spare. Without the red marks, I would be like a little, lost sheepling wondering what to do next and, consequently, choosing to do nothing. Several years ago, I attended a writing workshop taught by Anya Achtenberg. Because it wasn’t a university workshop, no grades were recorded anywhere–hence, some of the participants didn’t turn in their weekly work. In one class, Anya handed back the story I’d turned in to her, but with red marks all over it. Red marks are a badge of honor, you see. They are a badge of the hard-working writer. If a writer doesn’t write, she isn’t going to have any beautiful, raw stories that are crying out for improvement. If a writer isn’t brave enough to hand over those beautiful, raw stories to an editor or teacher or critique partner, she isn’t going to be seeing red. And seeing red is a good thing. Viewing the world only through the black and white filter of one’s own story is severely limiting. So, although I haven’t had much time to write or post blogs, I have been able to turn my work over to my friendly neighborhood editor, who in turn gave me something to work with in those few spare moments that I have. Being a sheepling has never suited me. Thanks, Editor! 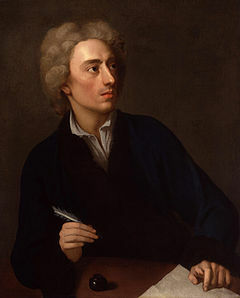 ***Painting of Alexander Pope by Michael Dahl. Yes, I’ll use ANY excuse to post an image of Pope. ****POST-EDITING to add this exclamation: Holy Guacamole! I just threw chapter three into its own document in order to begin revisions and realized for the first that this chapter, the one my editor spent less than a week line-editing, is 10,000 words long! The mind reels. Every week I fabricate more excuses for not sending out queries. Last week, I decided that, since Nathan Brandsford was deluged with queries, other agents would be as well. So I didn’t send anything off. Before that, I skipped the holiday rush, then decided it was best to wait until agents were caught up with their holiday rush. I’ve been, probably foolishly, waiting for the perfect moment–the problem being that there is no perfect moment, at least not that I can ascertain. Agents are swamped; there are simply too many writers out there, and the number of would-be writers seem to grow monumentally every year. I could bemoan my fate of being one drop in an ocean-full of writers, or I could simply move past it, accept my fate, and query. You see, I’m in my mid thirties, and I’ve always claimed to be a writer, ever since I can remember, anyway. In my twenties, I wrote several books, and I learned about marketing and publishing–and it was difficult enough back then. I decided those weren’t the books, that they weren’t good enough, etc, and I had a few children, went back to school to study for a creative writing degree, and then, finally, finally, wrote The Book. And now I discover that, though the publishing world was daunting in the nineties, it’s much worse now. Everybody, these days, has to write a book. Writers are, apparently, a dime a dozen. And I’m an insignificant little drop of water mixed in the ocean. However, I’ve written (I hope) an eye-catching query, a good working synopsis, and I’ve edited and polished and refined my novel, especially the tricky first thirty pages, and all this based on feedback from others, especially by an agent who judged a contest that I entered. I am, sadly, not a clever person, and therein you’ll find my weaknesses. The winners of this particular contest were based on a point system. Much to my chagrin, my points were in the top range for my writing, setting, characters, style, etc, and were at the extreme opposite end for my hook and plot. I already knew that there wasn’t anything wrong with my plot; it fit neatly on a typical plot curve of rising action, climax, and resolution. It was the way I described my plot in the synopsis that knocked me out of the running for first place, along with the lack of hook in my synopsis and in the first page of my novel. In case you’re wondering, I still won a hundred bucks, which I won’t say ‘no’ to any day, but I wasn’t numero uno. Although the review was direct and without commentary, it told me all I needed to know: Essentially, I had to rework the first pages and rewrite the synopsis (not to mention actually writing a workable query), and, at some point in there, develop cleverness. If you knew me, you’d know how difficult this was. I’ve never been clever, not ever, and I don’t like hooks, and I don’t particularly like beginning a novel in medias res. I’m a big fan of Ian McEwan, for example, whose novel beginning are, to put it bluntly, slow. If you’ve read Saturday, you know what I’m talking about. Basically, this book begins with a guy waking up in the early morning, staring out of his window, and ruminating for the next fifteen pages. I loved it, though I must admit the author lost me a little in the extremely long and slow racquetball scene that comes later. My point, though, is that, although I will read any kind of book, I prefer the ones that bring me into the action slowly. Of course, I don’t expect that much action in stories, anyway. Like I said, I’ll read anything. If it’s an action-packed book, so be it, but, if not, it doesn’t really matter to me at all. Regardless of my slow, ruminative nature, I coldly axed the first fifteen pages of my book. And I learned how to do hooks in my own style. I also, after many drafts, wrote a query that had my critics saying things like, “I’m actually really surprised at how good this is!” I didn’t take it personally. I just accepted the compliment for what it was. Next week, then, I’ll be sending off some queries. Wish me luck, pray for me, and send your positive thoughts my way (I don’t really believe in luck, just God and the serendipity that he sometimes brings my way).